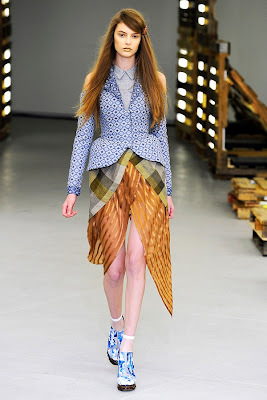 It's taken me a long time to post about Rodarte's shows because I'm still sorting out my thoughts about it. It was a very new direction for the Mulleavys, maybe the closest that they've come to attempting a kind of minimalism. Many people thought this was their most wearable collection yet but I feel like it's the opposite. 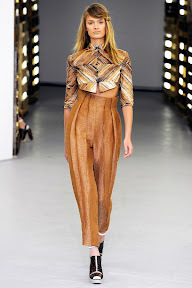 Without the usual embellishments and textures the clothes adapt a slight awkwardness that seems tougher to pull off than any laser cut leather leggings. I still found many things that I liked, but I also found more things i disliked than normal. 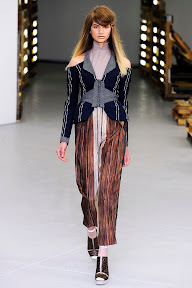 The first look's snakeskin turtleneck with cutout shoulders worn with double layered skirts is cool but mostly awkward. 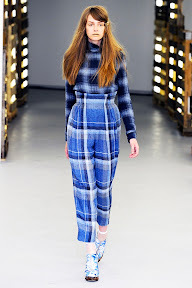 Other experiments with layering were a bit more successful like with their hourglass jacket worn over a wooly plaid and satin pieced skirts. 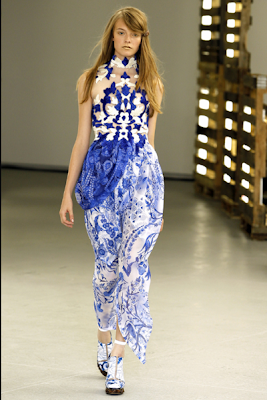 Their prints were my favorite part of the collection, and they seem to be a further development of the ones they used last season. 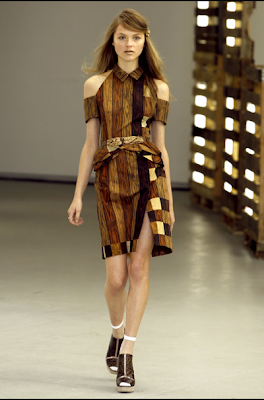 The wood-grain in particular is totally killer, and although I find most of the shapes aren't very flattering, once broken up and incorporated into a person's regular wardrobe they would become totally essential. I've never really bee able to get into cutout shoulders, but I guess I could reconsider for these. The patchwork shift with the slit on the front is actually kinda hideous but that's why I love it so so much. Three diaphanous porcelain dresses that came out mid-show also totally spoke directly to my heart. I hope I see some Carey Mulligan/Kiki Dunst red carpet moments in these. The stark color palette lacks a certain warmth and humanity/nature that their clothes usually have and I think it's those vibes that are throwing me off even more. Even their wood grain is more basement panel than tree-friend. clown clothes in more muted colors, weird 80's leftover glamour queen as dressed for an snl sketch, i cannot even tell you how unhappy these plaid pants make me, seriously barfcity. ugly pants attack again and become even more nauseating, someone please tell me why there are gold curtains on that bodice and jesus christ why does anja look square in some kind of sci-fi cosplay situation? So when it was good, it was really good and when it was bad it was painful. I appreciate that they are turning their boat around and trying new things, and I'm sure that if those rumors about LVMH possibly snatching them up are true, they will push themselves harder to uncover new ideas, which at the end is what it's all about. My feelings for their collection might be mixed, but they're definitely leaning on the positive side. you put your thoughts together perfectly. good, spot on review. the pants. the pants were the worst for me. yuck. Wow, I love the blue dress across! BUT I LOVED THE SCI-FI COSPLAY SITUATION! IT'S MY FAVORITE KIND OF SITUATION! I agree with you. I think the Mulleavy's have a big problem when it comes to confection, it always ends up looking clumsy at best. That's why their most successful looks are always the layered, soft and drapey. They should stay away from constructed/architectural lines. I mostly felt it was awkwardly styled, like what you said. I agree that some of the pieces might be interesting incorporated into someone's own wardrobe but I really just didn't love this. 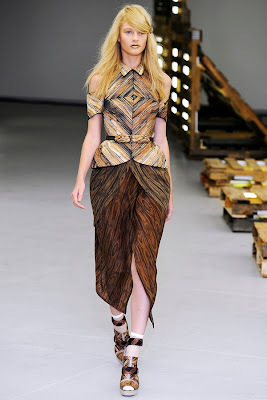 I loved the hair and makeup and color palette, the plaids and woodgrain fabric...but overall I just didn't dig it. It might be their most wearable collection to many, but for me it was the collection of theirs I personally would least like to wear.